Catherine Truman's fluorescent plant-like brooches. Artists at Adelaide’s Gray Street Workshop have let their imaginations run wild for an exhibition of eclectic jewellery incorporating everything from fluorescent hybrid plant forms and crocheted cotton to Christmas beetles made from old vinyl records. “It’s quite a wild collection of work – there’s nearly 100 pieces in the show,” Grey Street partner Catherine Truman says of the Cracker exhibition, which opens this Thursday. Truman has been making jewellery for 35 years and co-founded the group workshop in 1985. She says the main emphasis of Gray Street is on the “cross-fertilisation” between established and emerging jewellers, and this is reflected in the mix of exhibitors, with experienced artists such as herself, Sue Lorraine (the other original workshop partner) and Jess Dare showing work alongside that of younger artists Lisa Furno, Kelly Jonasson and Jordan Taylor. 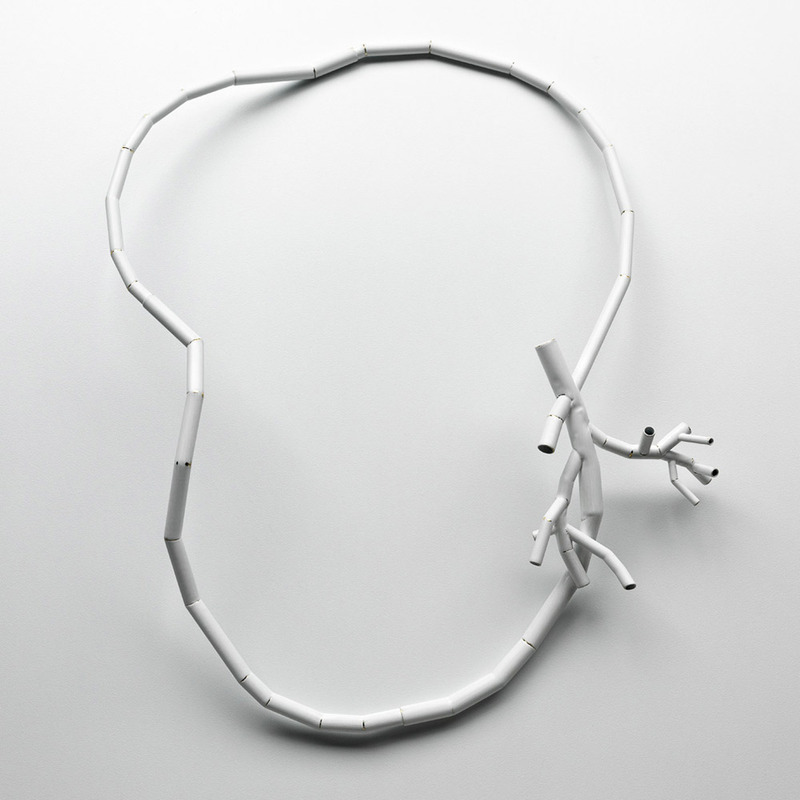 “We’re known for experimenting with lots of different types of materials and for this particular show, Jess Dare is showing some necklaces that are quite sculptural in nature … she uses powder-coated metal, so they have a ghostly white coating and there are a lot of geometric type shapes derived from plant forms. Those insect shapes include necklaces based on the moth form, and Christmas beetle brooches made from vinyl records – including, appropriately, a record by the 1980s-90s Australian band the Cockroaches. Truman herself has been working with thermoplastic (plastic with a low melting point that becomes pliable when heated). She adds fluorescent colours, presses the softened plastic into scallop shells, then peels it off to form beautifully detailed leaves that are used to create brooches that look like hybrid plant forms. 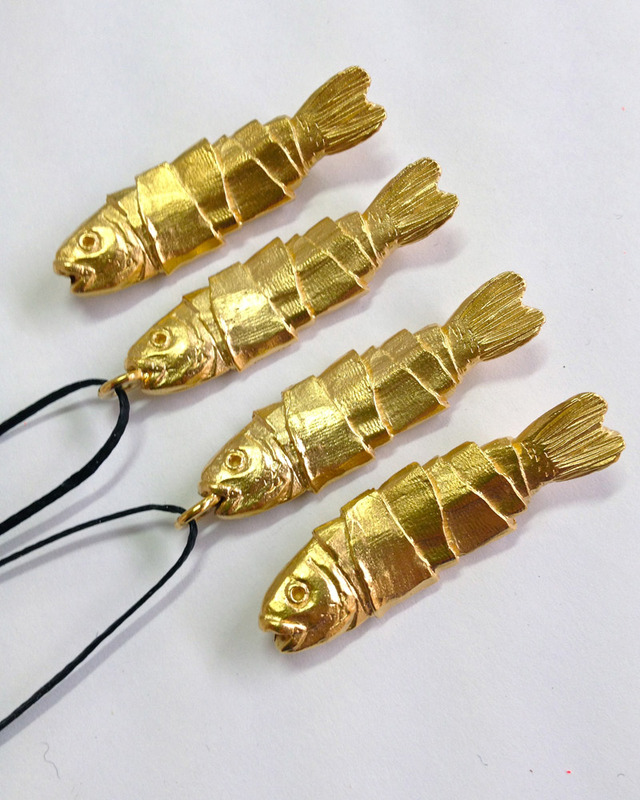 Cracker will also showcase her “lucky fish” brooches and pendants which are cast in sterling silver and, in some cases, plated in gold. 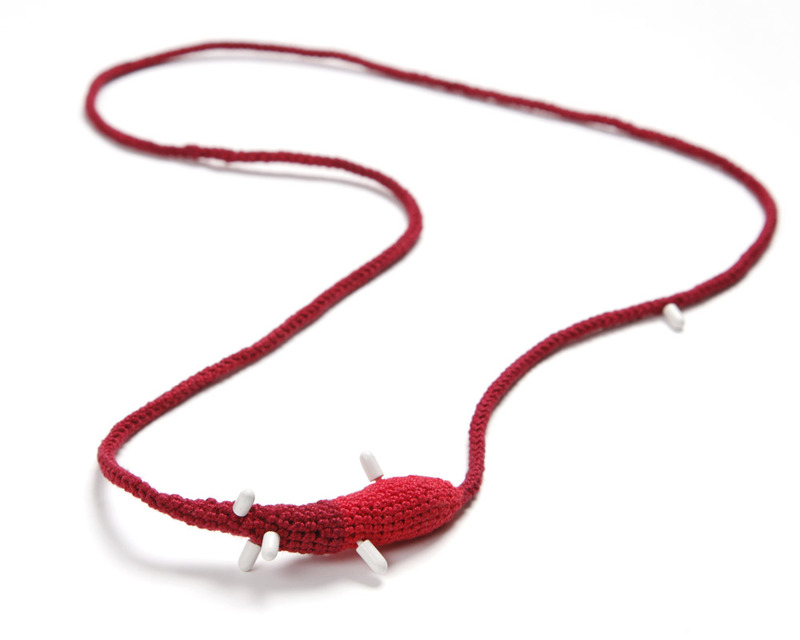 Jonasson’s necklaces and earrings are made with hand-made porcelain beans, crocheted cotton and handprinted canvas – “like a cross between clothing and jewellery”. Furno and Taylor have both used a technique called sublimation: Furno creates gestural drawings of traditional jewellery and transfers these to sheet aluminium, while Taylor has collaged images from children’s books to make brooches and neckpieces. Truman believes Gray Street Workshop is one of the oldest artist-run initiatives in Australia and says it has helped launch many careers, with around 90 jewellers having worked with the group since its inception. “There’s a lot of talent and tenacity required because it’s getting harder to survive as a full-time artist … there is more and more competition for funding and there’s a lot of contemporary jewellery and craft courses being cut from tertiary institutions. Cracker opens at the Gray Street Workshop (10 Sydney Place, Adelaide) this Thursday evening and runs until December 24.